UK government proposes speed camera network covering every A-road in the name of fighting global warming. The UK Commission for Integrated Transport last year proposed a nationwide blanket of speed cameras as a means of fighting global warming. After a series of trials, the Home Office is now set to make this a reality by approving early next year the SPECS3 "distance over time speed measuring device" that will make it impossible to drive on any primary road in Britain without being tracked and subjected to an instant fine for exceeding the posted speed limit. "With respect to technology, we are in a period of explosive evolution in traffic control technology," a commission report entitled Transport and Climate Change explained. 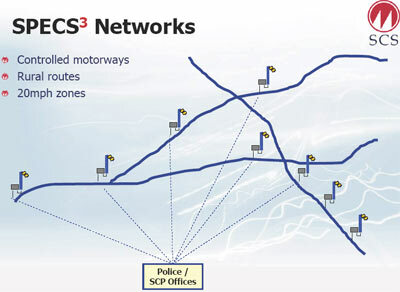 "The Highways Agency already uses several technologies which are either intended to manage speed, or lend themselves to that purpose by monitoring speed and sending drivers messages about their behavior.... Reducing climate impacts of the motorway network should be a major consideration in the development of motorway control and communications technology." The original SPECS systems, first approved in 1999, photographed vehicles when they entered a road, communicating the time of entry via a fiber optic link to a second camera positioned, say, two miles distant. After the second camera had identified the passing vehicle, the amount of time it took the car to pass between the two points was converted into an average speed. The system's limitations included an inability to ticket cars that changed lanes in between camera locations and a purchase price of £800,000 (US $1.4 million) to deploy over a distance of just a mile and a quarter. SPECS3 solves those limitations. It uses an ISDN connection to transmit data between any two cameras in the entire network, as well as the police headquarters, without the need for the expensive dedicated connection. This configuration slashes deployment cost over the same distance to just £67,000 (US $116,000). The system can also track drivers not only as they change lanes, but as they switch between different roads and highways. Pilot projects are already underway in Camden, Surrey and Northern Ireland where road trials began in April. Once established nationwide, records on all vehicle movements will be stored for five years in a central government Automated Number Plate Recognition (ANPR) server, allowing police to keep tabs on criminals and political opponents. Work on the data center in north London began in 2005 and officials expect real-time, nationwide tracking capability to be available by January. The original SPECS cameras were found to be quite successful. Between 2000 and 2005, a single camera in Nottinghamshire generated 76,000 tickets worth £4.2 million (US $7.2 million). London's entire SPECS network generated as many citations in just three weeks. London camera officials did admit, however, that 5600 tickets were sent to motorists who were completely innocent.